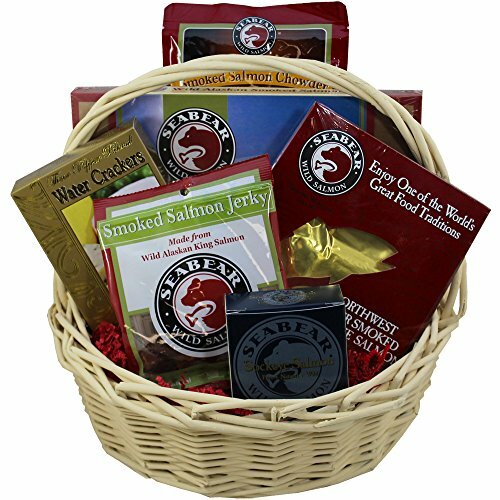 We take a lovely natural wicker basket and fill it to overflowing with our most popular and tempting alder smoked, kosher certified wild Alaskan Sockeye Salmon (Pure Canned Sockeye Salmon and Salmon Seafood Chowder are NOT Kosher). All of our salmon is caught in the Pacific Northwest and is shelf stable, so it does not need refrigeration until opening - making it perfect for safe shipping directly to your lucky recipient’s doorstep. Great gift for him or for her! Any grandma, uncle, brother, friend- or even a teacher or corporate client from the office will feel blessed to receive such an extravagant sampler of snacks. Each arrangement is hand crafted with attention to detail, shrink wrapped and tied with a bow for presentation, ready for gift giving. We take a lovely natural wicker basket and fill it to overflowing with our most popular and tempting alder smoked, kosher certified wild Alaskan Sockeye Salmon (Pure Canned Sockeye Salmon and Salmon Seafood Chowder are NOT Kosher). All of our salmon is caught in the Pacific Northwest and is shelf stable, so it does not need refrigeration until opening - making it perfect for safe shipping directly to your lucky recipient's doorstep. Great gift for him or for her! Any grandma, uncle, brother, friend- or even a teacher or corporate client from the office will feel blessed to receive such an extravagant sampler of snacks. All of our seafood products are shelf stable and do not need refrigeration until opening - making it perfect for safely shipping directly to the doorstep of your lucky recipient.